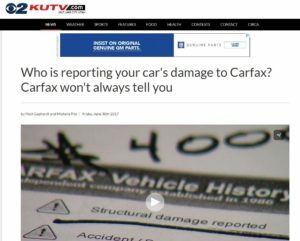 A Utah television station’s attempt to track down who reported structural damage to CARFAX shows the importance of securing customer’s information. KUTV’s “Get Gephardt” late last month described Amber Caygle’s shock at hearing her 2012 Mitsubishi Outlander Sport was relatively worthless — $2,000 compared to around $8,000-$10,000 — from a trade-in perspective because CARFAX declared it to have structural damage and have been fixed by a body shop. “It is your car, you pay for it, don’t you think that maybe entitles you to some right to know who’s saying bad things about it on CARFAX?” KUTV reporter Matt Gephardt says on the broadcast. CARFAX refused to reveal its source and pointed out that the car had indeed received a structural repair and its disclosure was a matter of “safety,” according to KUTV, which covered the story in a broadcast and slightly different article posted June 30. A Pennslyvania body shop owner has pointed out that an report for the vehicle from CARFAX competitor AutoCheck indicates Garff Enterprises – the Ken Garff body shop’s parent company – reported “vehicle body serviced” at exactly the mileage attributed to the body work on the CARFAX report. One possible scenario seems to be that corporate reported the work without the body shop’s knowledge. We’re not going to get into the ethics debate over what is appropriate to report to services like CARFAX and what those services owe a vehicle owner in terms of transparency. We point out KUTV’s coverage because it highlights two important issues related to collision repair and technology. One is the importance of safeguarding customer information through the shop’s own cybersecurity measures and by managing how repair information is transmitted through the Collision Industry Electronic Commerce Association‘s digital data standards. CIECA’s 2004 Business Message Specification is ideal, as it allows a collision repairer to transmit to a business partner (parts vendor, auto rental agency, etc.) only the estimate information needed by that particular industry. The Estimate Management Standard, which hasn’t been supported by CIECA for more than a decade but continues to be widely used, just uploads the entire estimate to the recipient unless the collision repairer takes steps to customize its delivery. Learn from the Society of Collision Repair Specialists how to do that on all Big 3 Estimating Systems here. In a similar scenario to the one reported by KUTV, a collision repairer in 2015 faced getting suspended from a direct repair program after a VIN database obtained a customer’s loss information. The VIN service confirmed it didn’t get that information directly from the information provider or the repairer, leaving that shop off the hook “but it further reinforced the need for collision repair business owners to have protocol in place to maintain control of information and data generated by their business,” according to SCRS. CCC has revised its system to transmit both BMS and EMS messages and will ultimately drop support for EMS in 2018. However, vendors and repairers have expressed outrage and concern about amount of power and control passing to the nation’s dominant estimating service and CCC’s plan to charge each recipient for every estimate they receive. Learn more about CCC’s plans and the accompanying controversy here. The other takeaway from the story is how little customers might understand their own collision severity — which could be increasingly an issue if photo estimating becomes more popular. KUTV reported that Cagyle thought that the damage was minor; “It was just like a fender bender,” she told the station. And yet, there was structural damage, both CARFAX and the $8,781.59 repair bill itself indicate. If the general public — or worse, adjusters lacking a background in modern collision repair — doesn’t understand that you can’t judge a wreck by its cover, it’ll create more insurer-repairer friction and potentially lead to more vehicles considered driveable that shouldn’t be.